You might be limited to a strict budget when you want to start a business, but that doesn’t mean you don’t have any options. It is possible to start a business with very little money if you have the right combination of skills, work ethic, and marketing know-how. Follow these simple guidelines to start a business when you have little to no money. Learn how to make money today. Bonanza another growing handmade marketplace, similar to Etsy. According to PC World, it boasts over 10 million visits per month. eBay is one of the biggest online e-commerce marketplaces in the world, and its streamlined store options, easy checkout through Paypal, and customizable listing options make it a great choice for selling items. Many business owners sell their products on multiple platforms to get the most exposure possible. It is important, however, to make sure your inventory stays updated on all sites you have a storefront on. If you want to learn about more resources for selling homemade items, check out this Lifehacker post. Drop shipping: Set up an online store and partner with drop-shipping companies that will do all the order fulfillment for you. Online e-commerce platform Shopify has a great drop shipping guide, and Tim Ferriss does a good job of explaining drop shipping in his well-known book, The Four Hour Work Week. Thrift stores and garage sales: If you know where to look, you can find items at thrift stores, antique shops, flea markets and garage sales and resell them online or in your local community for more than you purchased them for. One extremely successful example of this is Sophia Amoruso, the founder of Nasty Gal. Amoruso started buying and reselling vintage and unique fashion pieces on eBay, and her company has grown to a net income of $24 million in 2011 with over 200 employees. Her book, #GIRLBOSS, is in inspiring look into how she got started. One way to start a business with little to no startup capital is to sell your services, instead of a physical product. There’s a huge variety of services you can offer, depending on your background and interests. Some will require advanced degrees, such as accounting, while others require little more than a working knowledge of how it’s done (such as babysitting, lawn mowing or personal assistance). Because you are selling your services, you will need a branding plan to make sure your name and company get in front of the people who may need the service. Some places that are free for promoting your services include Fiverr, Craigslist, Elance, TaskRabbit and Skillshare. It’s also useful to have a website to show examples of your work, list your experience, and blog about your industry to draw visitors. If you want to learn more about branding and online marketing, check out Buffer’s social-media blog, Hubspot’s blog, Content Marketing Institute and CopyPress. Barter to get what you need. Unfortunately, it’s extremely hard to start a business without any type of funds at all. Even creating a freelance-writing business utilizing Elance and a free Wordpress or Wix website will still require a computer to work on as well as the Internet. However, there are ways to get supplies you need for starting your business without money. 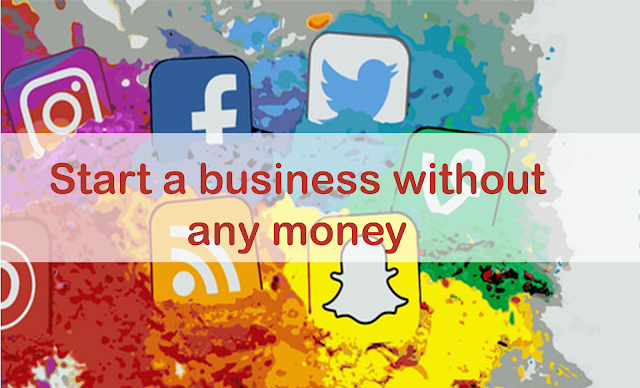 As mentioned previously, you can use sites such as Fiverr or Elance to advertise your products and services on, but you can also use these platforms to build up your own company. For instance, many designers offer $5 to $25 logo designs (that come with free revisions). Sort by reviews and look at past examples to find a designer or service provider that matches your style.